Herbal tea may not be the first thing you think of when you think of sage, however, sage has many medicinal properties and contains a good amount of healthy antioxidants that makes it a great remedy to ward off colds in the winter. Variations:Blend with yarrow, peppermint, and elder for a tastier tea. Recipe Instructions: Herbal Tea :You can make a simple infusion of sage, however, this cold remedy found in Mrs. Grieves "A Modern Herbal" is quite good. The old-fashioned way of making it is more elaborate and the result is a pleasant drink, cooling in fevers, and also a cleanser and purifier of the blood. 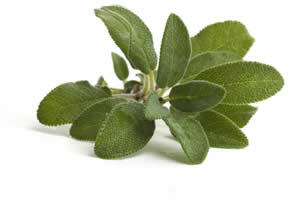 Half an ounce of fresh Sage leaves, 1 oz. of sugar, the juice of 1 lemon, or 1/4 oz. of grated rind, are infused in a quart of boiling water and strained off after half an hour. Fever :Herbs that reduce fever are used extensively in herbal remedies for colds, flu and viral infections.